I love TOMS. They are comfy, they are cool, and they have a story--you buy one pair, and TOMS gives a new pair to a child in need. 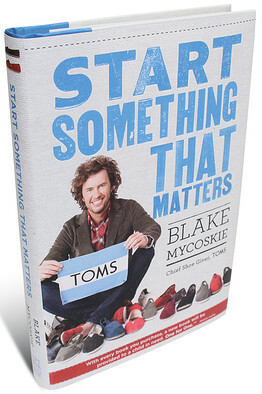 TOMS founder and Chief Shoe Giver Blake Mycoskie recently wrote a book called Start Something That Matters. It briefly tells the story behind TOMS--how Blake was in Argentina in 2006, how he saw these Argentine shoes called alpargatas, how he also saw children running around shoeless, how he was moved to start a new kind of shoe company that was both for-profit and charitable. That company became TOMS, beginning as a tiny startup running out of Blake's apartment that has now given away more than a million shoes to children in need. The rest of the book is Blake sharing his core values behind TOMS, like "find your story," "keep it simple," and "giving is good business." It reads a bit like an inspirational business book, one that wants to inspire a movement as much as it wants to share how TOMS did it. It's a quick and easy read, but one that packs in plenty of stories and ideas for how to start a movement of giving. 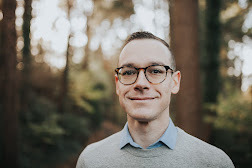 Many of Blake's values have significant spiritual connections (whether Blake realizes this remains to be seen; he doesn't bring up his spiritual beliefs in the book). An example: the power of story is central to TOMS, and the company's story inspires people to become evangelists of sorts, sharing the TOMS story with complete strangers who happen to like their shoes. It's a simple and memorable message: One for One. Blake could give a training in Evangelism 101. Leave a comment on this post with the following information: your name and your shoe size. (Anonymous commenters will not be qualified). Check back by noon (12:00 PM MST) tomorrow, Wednesday, December 14, when I'll post the name/shoe size of the winner. The winner will contact me via email, and I'll get you the book! It's that simple. Your name and shoe size. Check out Start Something That Matters here. Size 12 Joely Bear! I Love to win stuff!! Blake is a good guy too. He spoke at a United Way function in our area a couple years ago. He was easy to approach and genuine. Bandly Danforth, 11.5. I love watching caleb win stuff! Rilie Norton, 8 and a half. Sounds like a good read. Greggie :D 11.5 Please hehehe. Thanks joeliebear! #8, which is Emily Entsminger!